The Shocking Facts of Electricity Show visited the fourth grade classes. In this thrilling program, the students learned about atoms, electrons, voltage and fundamentals of magnetism and Ohm's Law. The audience enjoyed sensational demonstrations with a Van de Graff generator, light saber and a Tesla coil. 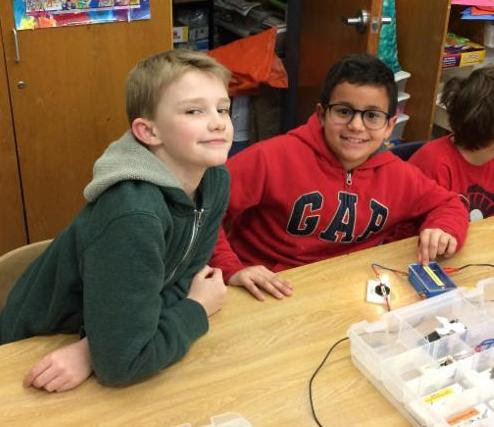 The assembly was followed by hands-on Circuits and Electricity Workshops. The students were familiarized with basic electrical components such as, electromagnets, resistors and conductors. They then used what they had learned to build various electrical circuits. What a exciting way to learn about electricity! Newer PostMark Your Calendars: Reading Spirit Week!